Bento 06 February 13, originally uploaded by frykitty. Mine is on the left, Spousal Unit's on the right. Using a couple of new boxes today! They are smaller than our original bento boxes, which caused a little spousal pouting. The contents (L to R): veggie curry left over from dinner, rice with a basil leaf on top, celery sticks, pistachios, sugar-free Reese's Peanut Butter Cups, tangelos. I've eaten the curry already (10 am). Mmmmmmmmm. 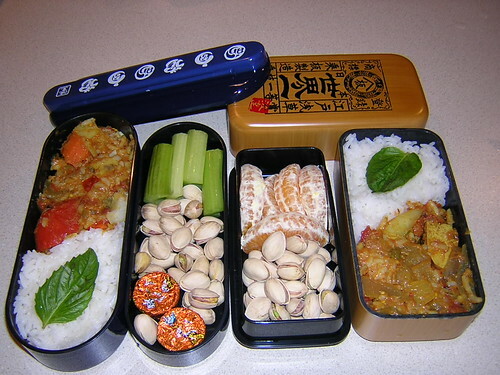 I found my way to your bento-blog of sort by accident, looking for places to buy new bento box around my place. I must say I admire your patience, creativity in your lunch making. Most inspiring. I love your meals and bento boxes. This is the second time I have had a small blog post about it. I agree with your spouse, these are lovely but too small. Hee! I bet you have! I've sent a lot of folks over your way for bento boxes.